Staying at Chapel Lane Caravan Club site we decide on a trip out. We are away with friends, they head off to Cadbury World with their kids. Being a bit tight and not having any kids with us we decide to pull on the walking boots and stretch the old legs. A couple of miles down the road we park our car in Mary Vale Road, Bournville, ironically next to Cadbury World. We wander down the road marvelling at the Almshouses and properties built by George Cadbury mainly, but not exclusively, for locals working in the factory over a hundred years ago. 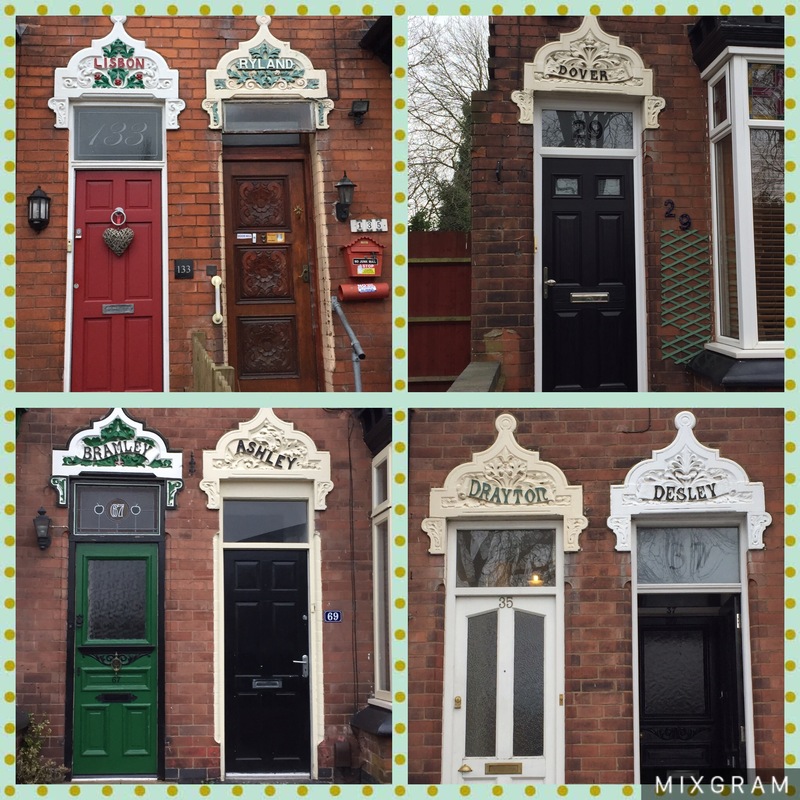 On closer inspection we spotted on the terraced houses opposite that each individual house was named with a beautiful stone carved name plate above the door. Each house was named after a town or city but we were totally confused by the random choice of names. Half were English place names, while the remainder were predominately Irish towns alongside place names around the world, so you would find one house called ‘Belper’ or ‘Chelsea’ sitting next to one called ‘Dresden’ or ‘Odessa’. A subsequent search on Google did not help, so any suggestions will be appreciated, the best guess we could come up with was the birthplace of builders employed at the time of construction. 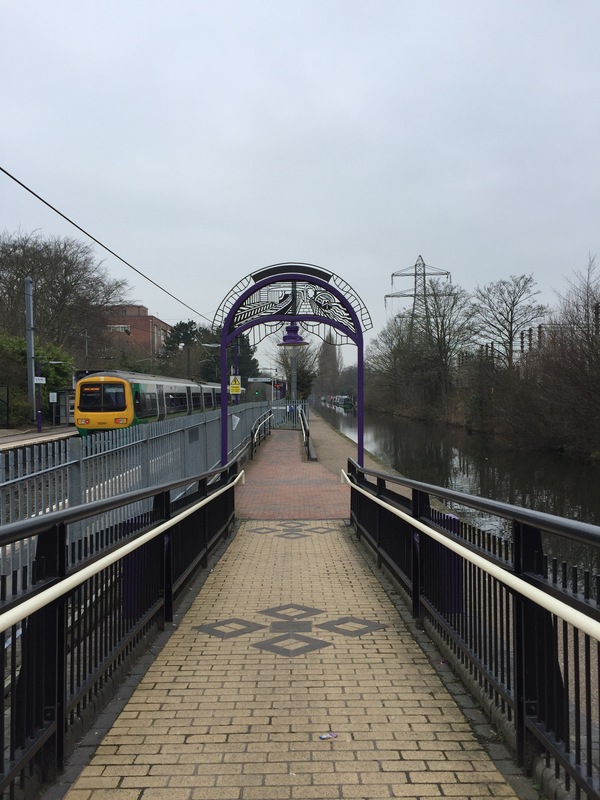 We always enjoy a canal walk, we like the contrasts, this canal sits alongside a railway line into Birmingham so you have high speed and low speed separated only by a fence, tree lined green spaces to our right as the canal sits calm and tranquil, while to our left steel, barbed wire fences and old car tyres frame the trains that thunder through every few minutes. Even the way these two highways cut through the hills and crossroads contrast, fabulous brick built tunnels look majestic next to the steel girders, nuts and bolts over the fence. An oasis of green and calm tranquillity slicing through a very busy city. Our other entertainment is our fellow travellers walking the footpath. We note that there are as many people smile and say hello that there are people unable to meet your gaze in case they have to acknowledge or interact with you. We move to the side to let all the cyclists pass, again, half showed appreciation while the urge to shout “you’re welcome” to the ignorant was well restrained by us both. One lady came past us marching vigorously with swinging arms while an old boy coming the other way did a perfect mimic and gave us a big wink. The canal opens up into the Gas Street basin. A mixture of new and old buildings offer a taste of modern day life. 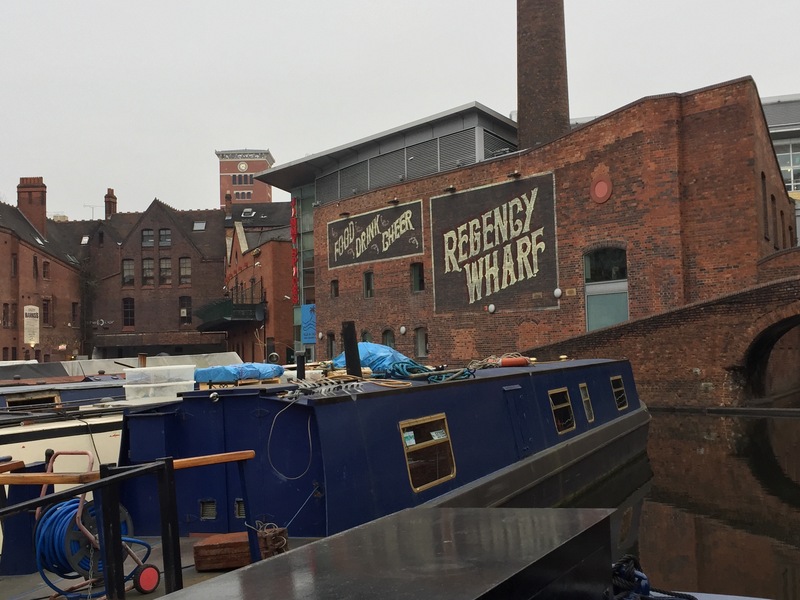 Restaurants, bars and coffee shops sit on the banks of the canal making the basin a very different place to what it would’ve been a century ago. Offices sit above the restaurants giving a glimpse into people’s working lives. Trapped in a 9-5 prison of computers, deadlines and meetings. Life moves so fast and stands still for no one. It felt good being on the outside looking in as the wheels of industry quickly turn giving us the desire to quit the rat race even more. It’s Valentine’s Day. A day we’ve never celebrated. Being tight we’ve always viewed it as a gimmick, a reason for Tesco to charge extortionate prices for wilting roses. Today, however, The Boss must have a bit of a temperature. He suggests that to celebrate we should head to a swish looking bar across the water for a cocktail. Not quite believing my luck I quicken my pace not wanting to give him reason to change his mind. As we arrive at the bar, the gloom descends, a rather swanky looking interior boasts a mix of crushed velvet and leather and chandeliers. Young men, suited and booted sit alongside their dates sporting the latest shades of lippy and eyebrows, high heels and perfume. Dressed in hoodies and walking boots I feel like we’d stand out like a sore thumb so we opt for the sugar rush of a large hot chocolate complete with cream and marshmallows and a generous slice of caramel shortbread, who says romance is dead. Heading back, the light is starting to fade and we’ve got 4 miles of unlit canal ahead of us. 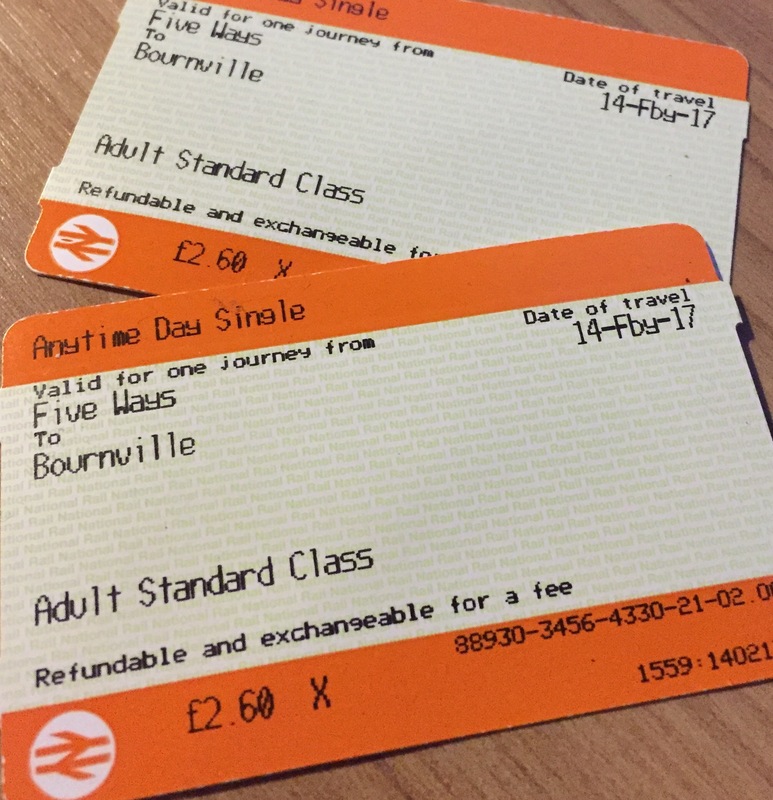 We didn’t get too far, Five Ways train station beckoned, £2.60 for a one way ticket back to Bournville. Perfect. Into the commuter crammed train we got, slotting in near the doors behind three young office workers entertaining the carriage with their stories of a recent lad’s trip to Benidorm – lovely! A couple of stops down the line the doors slide open and we are back at the car still in daylight … in rush hour traffic!!! It was an amazing few days. All good things come to an end though sadly. 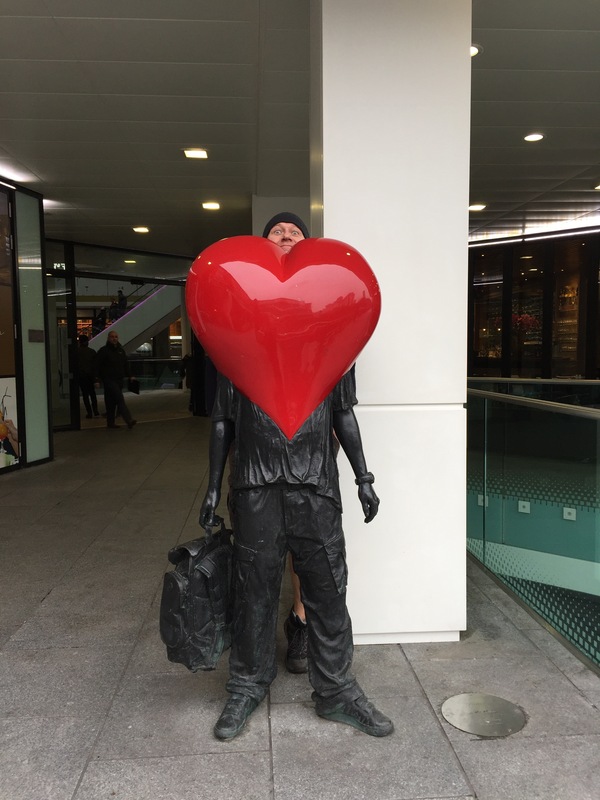 Amazing contrasts of life in Gas Street. Sailed through there a couple of times in a passed life on my narrow boat. The mojo does,nt float but still very enjoyable in different ways. Thanks for taking time to leave a comment. It’s great to see what was once a thriving area thrive again.